"I was smoking so much it was common place for me to be stoned, and I started doing it a lot by myself too. After a couple of suicide attempts - that I didn't really admit to - my mum saw me at home in my flat hugging my knees, rocking, and she knew immediately something was wrong," he told the Victoria Derbyshire programme. "Within 24 hours there was a GP out, and I was in hospital the next day. It plagued my life for about ten years after that. I couldn't function, and I was in and out of hospital ten times. I wasn't doing anything meaningful with my life. "When I stopped, the psychosis stopped. I was on medications and things but that was to rectify what happened before, so my brain chemistry could get some sort of equilibrium. When I stopped smoking, the symptoms disappeared. "If I had known the risks I doubt I would have taken it." 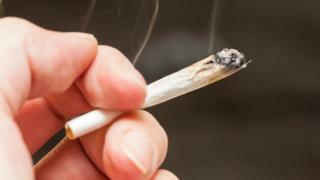 Removing strong cannabis from the market would lower London's psychosis incidence rate from 45.7 to 31.9 cases per 100,000 people per year, the scientists estimate.